My sister and I were both born with perfectly straight hair. I told you about the time that my mother melted the spongies in my hair but that wasn’t the first time she tortured us in an effort to make our hair curl! 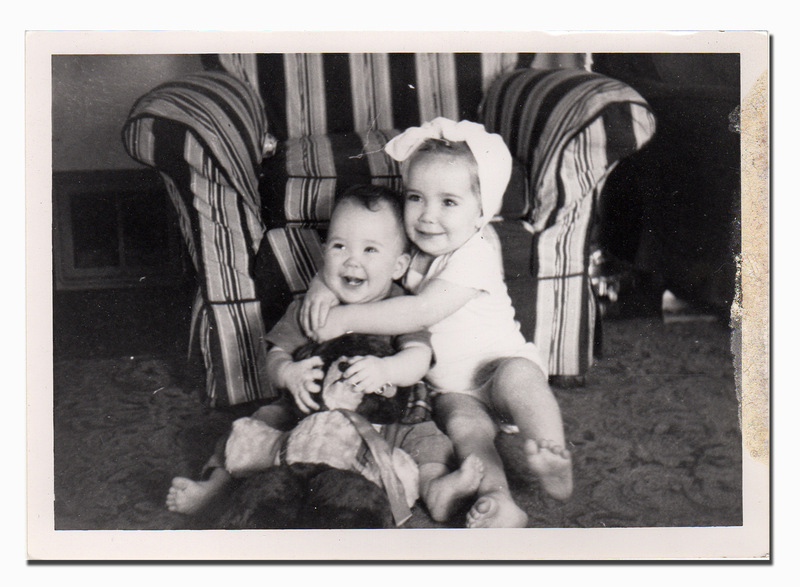 I have proof that even at a very young age, we were tortured with pin curls and even worse, I had an old diaper tied on my head to keep them in place! How humiliating. Judy was lucky in the early days; she didn’t have much hair until she was almost three so mom had nothing to curl! Then there were the perms she gave us. I think most grandmas will remember the Toni Home permanents that were all the rage in the fifties and sixties. This is the results of one of her attempts to perm our hair. I don’t really remember this one but I do remember others. These were taken out at my Grandparents farm. You can even see the windmill behind us and the barn that I would later swing out of on a rope. I remember the time that she and the lady across the street from us permed our hair for Easter. I really do remember them discussing the S-wave that the curls were supposed to have before they put the neutralizer on our heads. I remember my grandmother was so angry at what they had done to our hair. It stuck out like a bush and you couldn’t possibly comb it. This is Judy after her Easter perm. Then there were the perms Mrs. O gave us. She was a friend of my parents and she was a beautician with a sink and everything in her basement. Mrs. O was about 5′ tall and seemed short even to me. She wore wire rim glasses with her black hair pulled severely into a bun. She looked like a schoolteacher and was just as strict! I remember lying with my head in that sink looking up at the pipes of the basement ceiling and being sure she was pouring water straight out of the teakettle and onto my head! Complaining did no good. She would snap right back at me that the water had to be hot to stop the perm from processing. Maybe she was right as I do remember she never fried our hair, only our heads! I still have very straight hair. I have 3 curling irons, electric rollers and actual rollers under the sink. Nothing helps! This memory was posted in Memories FOR Amara and tagged hair, Kc the child, perms on May 2, 2014 by Grandma Kc. 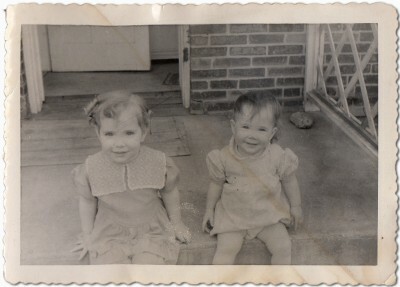 I think my mother must have given us a couple of those perms that just didn’t work or that washed out right away – hence the bush! Let’s just over process that hair as much as possible and inflict a little pain while we are at it! I can’t tell you how badly I want to see that picture of your triangle head! PLEASE! I love the funny comments and memories these posts and old pictures uncover! Now I just have to come up with another hair memory so that I can use the title “Another Hair Raising Adventure”. That is awesome! Oh, my, this brought back memories–all of them bad. Yep! Was there ever a good home perm for anyone? You are as adorable as ever in all of these pictures! I also remember those awful perms … they were torturous! Gah! Your poor heads! The frizzy curls are awful darn cute on you both, though. 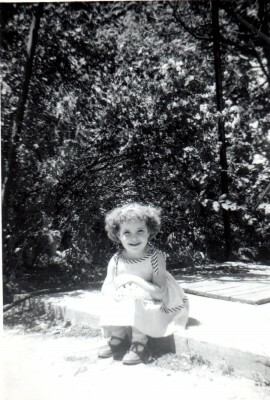 I remember my mom doing pin curls all over her head. And she slept on them? How, I don’t know. I used to get — and give — a lot of perms. My hair was stick straight and I longed for the lovely spiral perm ‘do. Never turned out all that great. And since my hair has turned gray (pretty much 90% so… but I color it), it’s turned wavy as can be. No longer need perms. Funny thing: My oldest recently had her new boyfriend over and they were looking through photo albums. They came across a photo of Jim with perm rods in his hair, during the time I was perming left and right (and he wanted to be cool… think Bradley Cooper in “American Hustle”). Jim was sitting there with them, going through the photos, and just about DIED when they came to that page. Too, too funny. I *love* these photos you’re sharing. What a treasure to receive all these photos, I’m sure! OH poor Jim! How embarrassing and he will likely never live it down! Hair is such a funny thing; it seems like the straight-haired girls want curls, and the curly-haired girls want straight! I’ve decided life is too short to worry. Both straight and curly have advantages. Your photos are so cute! My daughter Jenna actually got both and hates both! She has very thick hair and the underneath is VERY curly – much like her father’s. But the crown and sides are very straight – just like mine! Glad you like the photos! Oh my gosh… I only permed my oldest daughters hair once and she asked me to… it wasn’t good so we never did it again. I would never perm Valentina’s hair… it is too messy as it is… we would never get a comb through it. I have to admit that I did give Amara’s Mommy a perm once – I don’t think she has forgiven me either! So glad you are back blogging and visiting! My daughter didn’t have a head full of hair till almost three, but it was all curls. Now, it’s the flat iron for her. I remember tying my niece’s hair up in rags and what a feral child she looked like when I took them out, but she thought she was beautiful. Makes me laugh. Your granddaughter Missy Bugg has the most beautiful red curls ever! I would have given anything to have her hair when I was young – or now for that matter! But she will likely wish it was straight when she gets older! We all want what we don’t have! That’s so funny! I loved reading this. I never had my hair permed as a little girl, but I did when I was older, and boy, was it awful! 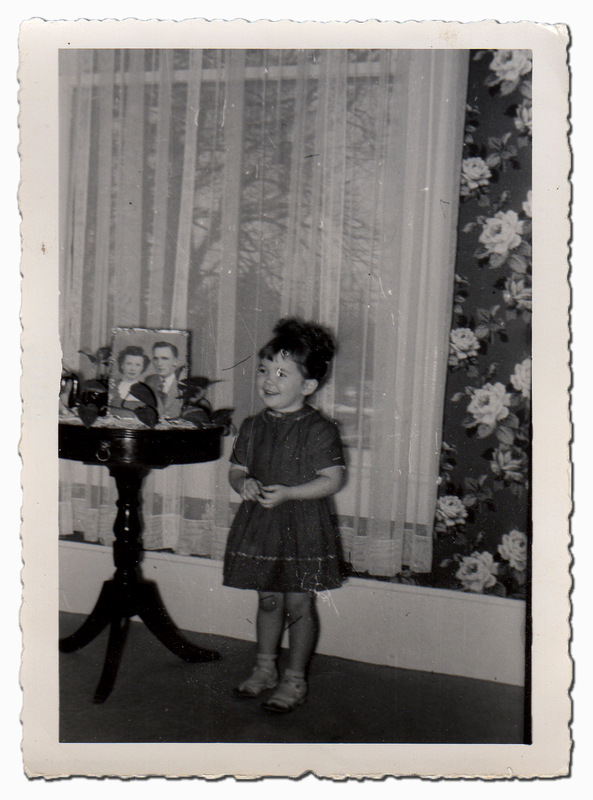 I do remember my mom torturing me with rollers – Oh, how I hated that! How did we survive sleeping in rollers — often those brush rollers? Thank goodness for electric curlers, curling and flat irons — life sure is easier! Glad you enjoyed the memory. 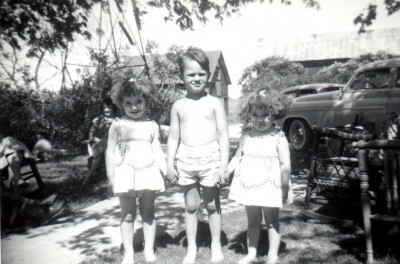 I really love that picture of Judy and I with your brother! I’m so glad Daddy took so many pictures! What really freaks me out is that back then our mothers used to “go to the beauty parlor” once a week and get their hair done. My mom would wrap hers up in toilet paper to keep it in place while she slept. I can’t imagine only washing my hair once a week! Things have changed! LOVE YOU, TOO! Too funny! I remember those perms, too. I did, however, enjoy that time back in the 80s (I think) when we were all perming our hair and letting it go natural with just a scrunch or two. The most carefree hairstyle I ever had! I remember having a perm in the late 80s, too! SO easy to take care of – there were a lot of things about the 80s that I miss! What is it with mothers and perms. My wife is Asian with straight thick hair and her mother perm her hair too. My mom had 2 boys so no perm for us. You were lucky you missed out on the perms! There was a time in the 70s and the 80s where even the men were having their hair permed. The days of big hair!!! I’m new to your blog! Nice to meet you. Oh the dreaded perm, I remember begging for one, then regretting it! Hi Sarah, thanks for stopping by. You are much too young to remember those dreaded Toni Home perms! But do keep these stories in mind as your daughter gets older – no perms! I am so glad your Dad took lots of pictures too! I loved the pictures of you, Judy and Jeff as well. I forgot about the toilet paper wrap! 🙂 You have an amazing memory! Thanks again for sharing those memories!